Osgood Schlatters disease is a common knee problem caused by irritation of the bone just below the kneecap which leads to pain and inflammation. It is most common in adolescents, tending to occur after a sudden growth spurt, and is usually associated with muscle weakness and tightness. Recovery from Osgood Schlatters can take anything from a couple of weeks to two years, depending on how well it is treated. Exercises are one of the key features of treatment for Osgood Schlatters Disease, and it is important to both strengthen and stretch the knee muscles, particularly the quadriceps. Here we will look at some of the best strengthening exercises for Osgood Schlatters and then go on to look at what stretches can help too. If you want to find out more about the causes, symptoms and other treatment options available, visit the Osgood Schlatter Overview. Muscle weakness is a common feature of Osgood Schlatter Disease and can actually make the condition worse. When there is muscle weakness, it changes the way the forces go through the knee, putting more pressure through the knee bones. It also means that the other muscles have to work harder to compensate, and they can end up developing problems. It is therefore really important to do strengthening exercises for Osgood Schlatters Disease not only to treat it but to prevent it from recurring. Here you will find some simple strengthening exercises that can really help Osgood Schlatters Disease. Once you have got to grips with these, I suggest you also start doing some stretching exercises to speed up your recovery. Starting Position: Sit in a chair, feet hip width apart with a soft/foam football in between your knees. Note: a) Ensure that you keep squeezing the ball throughout the exercise – keep the knee and buttock clench going throughout. Progression: Add a weight e.g. a shoe or ankle weight. Purpose: Strengthen the buttock muscles (glutes) to help support the knee and prevent excessive weight going through the inner side of the knee – a must for anyone with Osgood Schlatters! Starting position: Lie on your side with your hip and knees bent approx 90°, feet together. 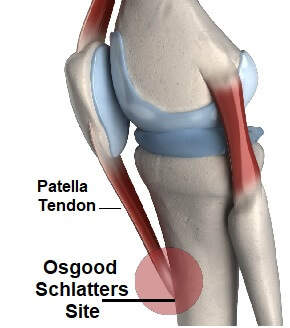 If you want to know more about Osgood-Schlatters Disease including more information on its causes, presentation and other treatment options, go to the Osgood Schlatter overview page. If you haven't already visited the stretches for Osgood Schlatters Disease page, I would highly recommend it, as muscle tightness is one of the key causes of the disease.